Metropolitan of Dryinoupolis, Pogoniani and Konitsa, Very Honorable and Exarch of Northern Epirus, Sevastianos (real name Sotirios Oikonomidis) was born on June 20 1922 in Kalogriana, Karditsa. After the Elementary School of his birthplace and the semi-high school of Farsala, he attended the Seminary of Corinth, and when it closed down, he continued his studies in the High School of Karditsa. After graduating in 1941, he attended the School of Theology of Athens University, where he graduated from, in 1949. Then, he performed his 28-month military service, at the Military Theological Office. In 1952, he became a member of the Theologian Circle “ZOI” (i.e. Life) and in 1960 a member of the Theologian Circle “SOTIR” (Savior). At first, he was hired as a secular preacher at the region of Messinia. Then, he became a monk in the Sacred Monastery of Asomaton Petraki in Athens, changing his name to Sevastianos. He was ordained a Deacon by the current Metropolitan of Lemnos (later Trikkis and Stagon) Dionysios in August 1956. In June 1967 he is elected Metropolitan of the historical Metropolis of Dryinoupolis, Pogoniani and Konitsa. Fully apprehending the great responsibility of such a call, in his speech at his ordination as a bishop, he mentions: “Times are arduous. People’s faith is shaken. Sin grows insolent. Evil is culminating. Therefore, we need competent bishops with faith, holiness, self-denial, fervid eagerness, education”. Thus, with his valuable work he himself revealed the poor region of Konitsa, one of the smaller metropolises of Greece, as the citadel of Hellenism – defender of the borders and a bulwark of the Greek – Orthodox ideals and visions. The name of Metropolitan Sevastianos became widely known both in Greece and worldwide for his fighting spirit in claiming the rights of Northern Epirus’s Hellenism as well. a) Metropolitan Sevastianos built the glorious Sacred Temple of Saint Cosmos the Aetolos in Konitsa, a unique temple for the region of Epirus, and also the biggest one dedicated to Saint Kosmas in whole Greece. The later is annually commemorated in great sumptuousness, being worshiped by all Greeks. b) During his Prelacy and thanks to his personal interest, two historical Monasteries were renovated: The Holly Monastery of Stomio (18th century) and of Molyvdoskepastos (7th century, by the Greek – Albanian borders). c) He established Konitsa’s home for the elder, in order care to be provided to indigent old people. d) He established two boarding-houses, which previously accommodated gratis poor High School and Lyceum students from the greater area of Konitsa, and which, from 1990 until nowadays, accommodate students (both Greek and Albanian-speaking) from the whole of Northern Epirus. The Albanian-speaking students, as well as the students with learning difficulties, have the opportunity to attend special tutorials provided by teachers of the relevant subjects. Metropolitan’s special care for those children (i.e. children from Greece and Northern Epirus) continued even after their departure from Konitsa for further studies. He provided for their stay at the place of their studies, undertaking himself their expenses, so as for them to be able to focus on their studies. S.C.C.N.E.R. – Σ.Φ.Ε.Β.Α. is well aware of the large sums Metropolitan Sevastianos offered to support the indigent students, some of whom are its members. e) He reorganized the cultural center of Metropolis, establishing Sunday schools, camps, as well as three new conference halls for lectures, preaching and other events. His personality drew the attention of clergymen, professors and scientists from all over Greece and abroad, who willingly offered their services, helping him with his work. As early as his very first day at the Metropolis of Konitsa, Metropolitan Sevastianos promised that he would strive with all his powers for the restoration of the rights of Hellenism and Northern Epirus. In his speech after his enthronement (29.06.1967) he specifically stated: “At this moment that I for the first time ascend this throne, my mind turns to our unredeemed brothers at Northern Epirus; those who suffer under the yoke of bitter slavery, and I want to reassure them that not only our prayers shall accompany them every single day, but we shall do everything in our power so as to release them from the chains of slavery…”. He kept his promise in every means available, even though he had to face difficulties, vulgarities and tough criticism. Sevastianos was the Prelate whose name was directly related with the Northern Epirus’s issue. OMONOIA of Argyrokastro in a letter (1991) referred to him as the “Symbol of Northern Epirus’s Hellenism”. 1) He was the man who reanimated the Northern Epirus’s issue. At a time when no one spoke of Northern Epirus, Metropolitan Sevastianos was the only one who traveled around Greece, informing people and protesting for the tragedy of the forgotten Greeks. He also visited the American Congress and the European Parliament, denouncing the Albanian atrocities. a) In the year 1982 he founded, and later on he organized and financially supported the unique students’ coordinating committee for the Northern Epirus’s issue – S.C.C.N.E.R. – Σ.Φ.Ε.Β.Α. And what’s more important, he was the soul, inspirer, and heartening agent of S.C.C.N.E.R. – Σ.Φ.Ε.Β.Α. It was him who infused strength to S.C.C.N.E.R. – Σ.Φ.Ε.Β.Α. with the power of his soul, his struggling spirit, his scrupulous morality, his whole life. It is for him that the students and the young members of S.C.C.N.E.R. – Σ.Φ.Ε.Β.Α. sacrificed – and still do so – their time, pleasure, vacations, classes, for the sacred struggle of Hellenism of Northern Epirus. 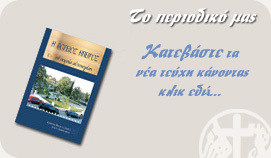 b) In the year 1987 he founded the Pan-Hellenic Association for the Northern Epirus’s Rights (P.A.N.E.R. – ΠΑ.ΣΥ.Β.Α. ), seated in Konitsa, in which, among others, prominent scientists and diplomats participated. P.A.N.E.R. – ΠΑ.ΣΥ.Β.Α. has organized two scientific conferences (in 1987 & 1990), whose minutes have already been published. c) Sevastianos published about fifteen books on the Northern Epirus’s issue, many of which have been translated into English, German, French and Albanian. 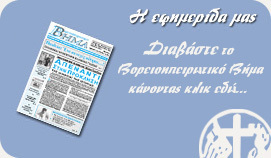 He also published the newspaper “Voreioipeirotiko Vima” (i.e. “The Northern Epirus’s Tribune”), the official instrument of P.A.N.E.R. – ΠΑ.ΣΥ.Β.Α., which he presided. - Vigil by the Greek – Albanian borders, in the Holly Monastery of Molyvdoskepastos on August 15. - Easter Mass at the remotest village of the borders, Mavropoulo, opposite Dropolis of Argyrokastro. The Easter ceremony was instituted during Hozha’s era after the request of the Northern Epirus’s Greeks, who until then used to attend the Holly Mass behind the shutters of their homes, while the echo of “CHRIST HAS RISEN” came to them through powerful loudspeakers. - Especially significant was the organization of a “three-day of mourning and prayer” at his Metropolis in mid February. The event climaxed on Sunday, at the village Delvinaki, where, after the Episcopal Mass, a commemorative prayer was chanted on the grave of the Metropolitan of Dryinoupolis, Vassileios (minister of the Sovereignty government in 1914), followed by a speech by Metropolitan Sevastianos. Finally, in the border guardhouse of Cacavia, he addressed a message of friendship and cooperation towards the Albanian people, as well as a message of protest towards the Albanian government. Thousands of people from Greece participated in those events. We should underline that Metropoliatan Sevastianos’s national struggle, was deeply spiritual, as he strongly believed in the power of prayer. That is why he entrusted a monk from Mount Athos, father Gerasimos Mikragiannanitis, to compose a ritual to the saints of Northern Epirus, in favor of Northern Epirus’s people. e) The Metropolis of Konitsa during Hozha’s era was the shelter of fugitives, from both Northern Epirus and Albania. All fugitives, regardless of their nationality, were welcomed in the Metropolis receiving consolation, love and hope. 2) Even after the fall of the live barbwires (1990) in Albania, he continued his struggle more intensively; focusing on the Northern Epirus’s people staying in their homeland. a) He was the first to indicate that with Berisha in office, the persecution of the Greeks would go on. When in Greece everybody was pleased by Berisha’s accession to office, when the politicians were supporting Berisha’s party, Metropolitan Sevastianos was the first to underline that: “Albanian politicians hate Greece the same, regardless they belong to the right or left wing”. Greek politicians realized that much later. b) He organized missions of hundreds of tones of humane aid to Northern Epirus. We must point out that this assistance was sent indiscriminately to Greek and to Albanian-speaking and Moslem villages as well. c) The small Metropolis of Konitsa helped significantly by sending priests to cover the religious needs of the regions in Northern Epirus, especially in the early years, before Northern Epirots and Albanian priests were ordained. d) Metropolitan Sevastianos financially contributed to the church committees of Northern Epirus for the rebuilding of temples; he paid teachers in order to provide Greek language courses, and in general there was not a single Northern Epirot or Albanian who requested and did not receive a small or bigger financial help from the Metropolis. e) We have already mentioned the accommodation that children from Northern Epirus enjoyed in boarding houses in Konitsa. We also must note his personal interest in the enrolment of those children in Universities (especially in the School of Theology), and the reimbursement of their expenses. f) Of paramount significance is also Metropolitan Sevastianos’s offer contribution for the establishment of the “Radio Dryinoupolis” Radio Station. By means of three powerful transmitters, the orthodoxy and Hellenism message was able to reach the regions of Dropolis, Argyrokastro, Tepeleni, Premeti, Pogonio, Aghii Saranta, Vourkos, Chimarra in Northern Epirus, and in Greek territories as well, such as Epirus and the Ionian islands. Through broadcasts in both Greek and Albanian language about Greek history, the history of Hellenism and Northern Epirus, and by means of Greek language lessons, there was a daily communication between His Reverence and the biggest part of Northern Epirus’s Hellenism, which nowadays lives in their fatherland. The sobriety of the radio station, its substantial program, the love of people as well as its ratings have enraged the Albanians and their “allies” in Europe, who are oppressively trying to close it down. g) Finally, we must refer to the open letters of appeal that have been handed out in thousand of copies, concerning the return of the Northern Epirus’s people to their homeland. h) All this strives has been carried out under extremely difficult circumstances. However, Metropolitan Sevastianos, derived his power from his faith in God, his serenity and mostly from his devotion to truth and justice, virtues that he served with devoutness and responsibility. His modesty and his disinterested struggle glorified him in the eyes of the people, and he won their trust. More specifically, in his testament he mentions: “I praise the Lord with all my heart and soul, because, though I am unworthy in every aspect, he honored me in many ways, and he blessed me with the highest dignity of Prelacy. Blessed and praised be His Holly Name for ever and ever”. And later on he says: “I suppose that now, as things have turned, everybody can understand the purity of my intentions”. The luminous personality and the incomparable work of the indomitable bishop, keep him alive in the memory of our Church and in our hearts as well. The modest Prelate marches before us in our minds, and enlightens our path. In a country like Greece, which is constantly alienated by its own smallness, and is more and more impoverished by the absence of great leaders, it is essential to grace such great people and to follow their everlasting and undying standards. Sevastianos, His Reverence, Metropolitan of Dryinoupolis, Pogoniani and Konitsa.